I was asked to donate a book that had a Christmas scene in it to a group project. As I thought through my books, I realized that 8 of my 22 fiction books have very prevelent Christmas scenes or themes. Eight! What’s so odd about that is that I’ve only intentionally written 2 Christmas novellas — Christmas Diamond and Christmas Star Sapphire. It makes wonder what it is that makes Christmas such an integral part of my mind that I would have it be a strong theme in more than one-third of my books. There is a special beauty about tying Christmas together with romance, I think. It’s an opportunity to let your characters thoughtfully give a gift to the one whom their hearts desire. In several books, I’ve had that so very special Christmas gift be the tipping point in the revelation of an unspoken or unacknowledged love. It’s a time of gathering together with family, which allows for dynamics in writing to come through that would almost feel forced if they were added a different way. You can give so many subtle clues to the upbringing of your main characters that can be displayed through relationships with siblings and parents in social situations — good and bad. It provides opportunities for the other main character to learn about her love interest in how he reacts to a crazy aunt or for him to observe how she loves on children. It’s a time of giving and volunteering, of church services and choir rehearsals, which opens doors to allow your characters to show their love for their fellow man and to worship God and rejoice the coming of the Messiah. Christmas can provide testimony for the characters’ faith, opportunity for the faith to grow, reasons for the faith to be tested. Through it all, it’s a time for romance to grow and bloom, to be discovered, to come to light. That special gift, that meaningful interaction, the beauty of that faith – all of it can tip a romantic scale and bring two people together in a way that adds to the beauty of the season. And, of course, there’s always room for a mistletoe moment! I love Christmas stories that are also romantic stories. My go-to watching for the season are the sappy Christmas love stories that used to dominate just the Hallmark channel but now fill my Netflix queue. 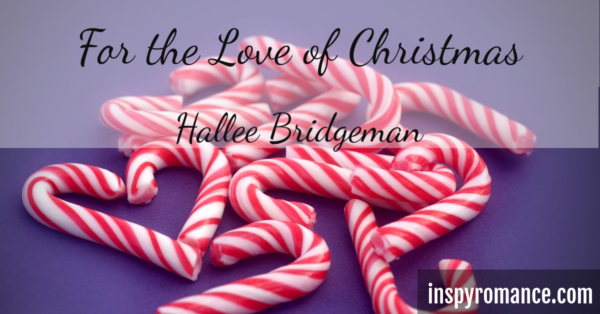 Do you love Christmas love stories? 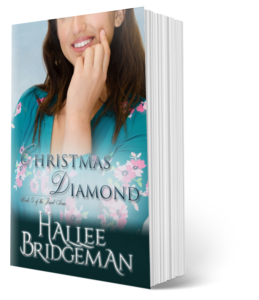 I have one that’s free – Christmas Diamond, which is the first of my Jewel Series second generation books. It is a very short novella that I wrote as a Christmas gift to my readers about five years ago. And because I love Christmas, I’m running a 12-Days-of-Christmas Giveaway! You can enter to win many fabulous prizes every day — and even go back and enter all the days you want, but day 8 was my special book bonanza giveaway – 11 autographed contemporary Christian romance novels!. You can find all about it at this link. Reply to this post and let me know what you like about love stories with Christmas themes. 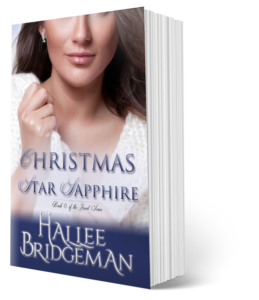 One commenter will receive both autographed copies of both Christmas Diamond and Christmas Star Sapphire. I pray you and your family have a very Merry Christmas. Hi Hallee! Having been retired for six years, I have enjoyed reading hundreds of Christmas stories. So many stories available through Christmas themed boxed sets. I am amazed at the imagination of authors. Holidays often bring couples together. In the north holiday lights and displays are magical and romantic. Lots of special events to write about. Thanks for sharing. Merry Christmas and best wishes. It is wonderful that there are always so many Christmas box sets out there! Merry Christmas to you as well. Hi Hallee! I think you win the prize for the most Christmas stories, but I love writing them as well. For me, it’s the fun go-to scenes: decorating the tree, baking cookies, family gatherings (that can go awry) and children’s Christmas pageants (that can also go awry). Add in the possibility of a snowstorm, and you’ve got all the makings of a fine romance. I think I am going to be uber conscious of it now that I realize it – lol. Hello, Hallee. I like a romance story involving Christmas time. Have a merry Christmas, Kathy! I love your Christmas scenes in your stories, especially in the Jewel series – Maxine and Barry’s story around Christmas was beautiful! You made me go count LOL. Of my (currently) 27 titles available, 5 of them are straight-up Christmas romances, and an additional 5 span the Christmas season and include a scene from Christmas Eve or Christmas Day! I love to read and am really enjoying reading the boxed set of Christmad stories where you get to read several different authors and get to find out about new ones that you can add to your must read list. I agree with all the other posts on all the wonders and blunders thst can happen during the holiday season. But I love the way you bring in the true meaning if Christmas and life in general in all your books and show how Christ should be the center of all we do. Merry Christmas. Thank you so much, Lorel. Merry Christmas to you! Hello, Hallee! I love Christmas books, and you described so beautifully all things meaningful and special about Christmas stories. And it’s very generous of you to do autographed paperbacks giveaway! I really enjoyed Christmas Diamond, mostly how you connect with the story of Faith’s grandmother. It’s too fast of a love story for me, I’m more into Christmas Star Sapphire in which they have time to build something solid… maybe we’ll have a sequel to hear about how their relationship actually turned out? I know Christmas Diamond was fast. I actually wrote it in 3 days – lol. Jade’s Match is the next book in the 2nd generation series. There’s some mention of them. Now I just need to work my way through Sarah and Derrick’s children to conclude the 2nd generation. Your books sounds very interesting. Thanks for the giveaway! I vote for Christmas stories all year round!